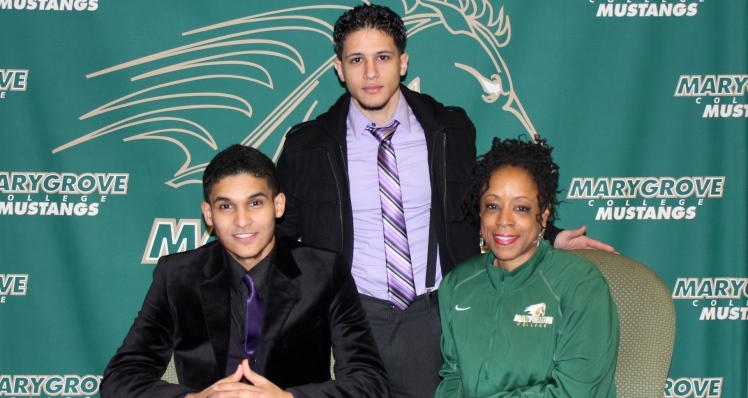 DETROIT, Mich. — Third year head coach LaCema Womack boosted the talent level of Marygrove’s cross country and track & field programs with the signing of local talent Almutasm “Moe” Nassr. The signing, announced Wednesday (Dec. 11), kicked off the 2014-15 class of commitments for Womack’s programs. Nassr, a 5’5″ senior at Detroit’s Universal Academy, will make the short trip up the lodge freeway to attend the northwest Detroit campus beginning Fall 2014. With an extensive running background at Universal Academy and in Think Detroit Pal, Nassr will join the college ranks primed to be one of the Mustangs’ top runners from the outset. During his time as an Eagle at Universal Academy, Nassr ran his way to an All-Area Championship in cross country and track & field. Nassr has been running for the Eagles cross country and track & field teams since his freshman year and primarily competes in the mile and 800 for the track team. In summer of 2012, Nassr traveled south to Houston, Texas, to compete in the National AAU Track & Field Junior Olympics. Nassr qualified for the Junior Olympic meet after posting a qualifying time earlier in the summer of 2012. The distance runner participated in the 800, 1,500, and 3,200 in Houston. The dedicated runner recently took to the streets of Detroit to participate in the 2013 Turkey Trot. The high school senior completed the road race 5K event with a stellar time of 15:53. Coach Womack on Nassr: I first recognized Moe at a Junior Olympics qualifying meet during my time as an AAU official. From there, Moe caught my attention at the national meet as he continued to compete well against the nation’s top talent due to his excellent speed and endurance. After seeing his times in the 800, 1,500, and 3,200 events, I am convinced Moe will be a true asset to our men’s team. I welcome Moe to the program and predict him to be one of our top cross country runners over the next four years.